Hello from Madrid. I attended my first bullfighting event at the historical Plaza de Toros De Las Ventas arena. 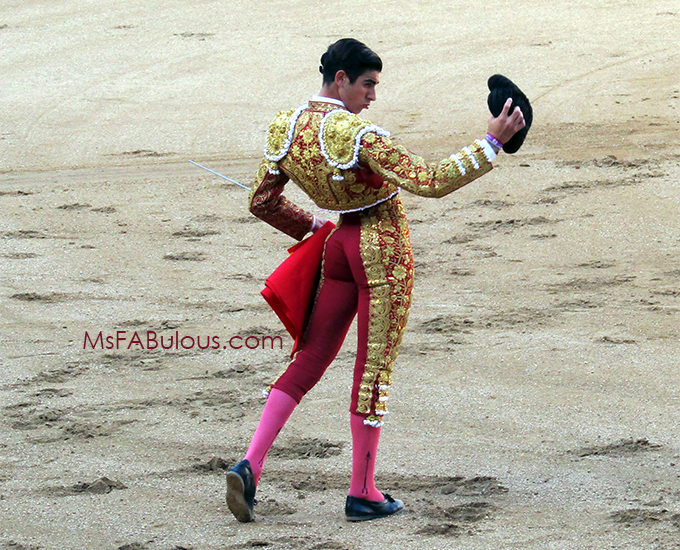 I was drawn to see the beautiful embellishments of the Matador costumes. They are called Traje de Luces, roughly translated as a Suit of lights. They richly embroidered garb uses metallic sequins as well as gold and silver metallic thread. The overall look of the suits takes their inspiration from the Spanish dandies of the 18th century. The black hat is called a montera and was added to the standard ensemble later. The ritual of dressing for the bullfight is a production in itself. The star matadors have a squire to help them dress. The typical elements include the short, rigid jacket, attached at the shoulders, so the arms are free to be graceful with the cape. The incredibly snug (as in nothing left to the imagination) tights are also embroidered. I was surprised I didn't see scores of groupies stalking the performers on this item alone. Considering the danger of being gored by a 1200lb bull, I was surprised at how little protection the footwear provided. Little flat, ballerina-type slippers and thin socks provide little to shield your toes from big horns. I had a very tough time with the goring and violence of the event. However, I did want to attend to see the costumes, the performance and to see what it was about this tradition that inspired work from composers like Georges Bizet, art from Pablo Picasso, prose from Ernest Hemingway and couture from Cristobal Balenciaga. There is a deep pageantry in what they consider both a performance art and sport. 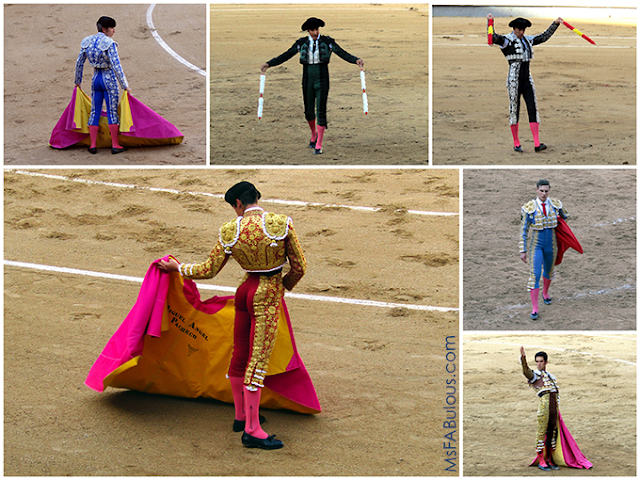 Many bullfighters come for multiple generations of matadors. There is a lot of passion and respect for the culture from aficionados of the tradition. Is it possible to see only the beauty of the dance and the details of the Matador costume without the sadness of the kill?